I’ve lamented many times the horrible road salt in Michigan, which is why I have decided to start a series called “True Survivors of Detroit” in which we applaud Motor City-area cars that—despite heavy corrosion and questionable structural rigidity—continue trudging on like champions. This week’s survivor: a rotted-out Dodge Ram 2500 conversion van. For the longest time in the U.S., conversion vans were hot stuff. For one reason or another, people wanted to turn their full-size vans into living rooms on wheels, with giant captains chairs, cushy couches, cathode ray-tube televisions, window shutters and tons of extra headroom thanks to that tall roof installed by a third-party outfitter. Among the most popular conversion vans in the 1990s was the third-generation Dodge Ram Van; this one that I saw in Royal Oak, Michigan, is one of only a few left on the road in this area. That’s not particularly surprising when you look at this example. The driver’s side rocker panel has been thoroughly chewed on by Sodium Chloride, and turned into iron oxide. 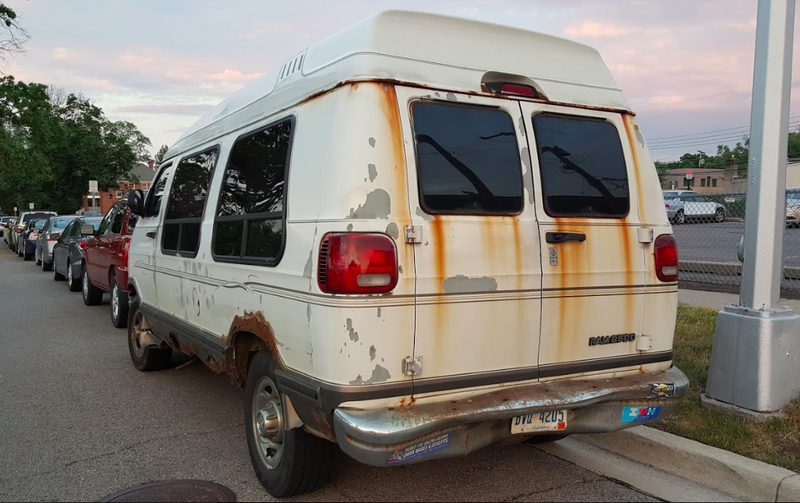 That rust has fallen off, likely been pushed off the road, and become part of the soil so that someday, another soon-to-be-rusty Dodge Ram conversion van can sprout from it and serve a new generation of Living-Room-Van-fanatics. While it may be surprising that it’s still on the road, it’s really no surprise that this truck is still running, as these Ram “B-vans” came with fairly stout engine options: a 3.9-liter Magnum V6, a 5.2-liter Magnum V8 or a 5.9-liter Magnum V8 could be found under the doghouse between the driver and front passenger seat. These were all fuel-injected iron-block, pushrod motors that were mated to tough Chrysler 727 or Chrysler A-904-based automatic transmissions. The van is based on the same bones that underpinned the “B-Van” when it first launched in the early 1970s: it’s got a “uniframe” structure with a leaf-sprung solid rear axle and a coil-sprung independent front suspension. Like B-Vans of yore, front brakes are discs, rears are drums. With its basic design remaining unchanged for so long, you can understand that, by the time the B-Van reached its third-generation, much of its mechanical quirks had been sorted out. Well, except for corrosion, because as we can see here, B-vans had a tendency to rot into oblivion. Still, this one in Royal Oak marches on through Michigan streets, with brown rust stains on its paint, the driver’s side rocker panel completely rusted out, and the passenger’s side running board hanging on by a thread. Much respect to this old B-Van. Never give up.